Mouvement produces transformational events for individuals, community groups, not-for-profit organizations and corporate clients. Mouvement holds experiences in urban spaces, in nature, in the community, at work places – and in the Om Dome – a portable 700 sq. ft. geodesic dome which serves as a mobile studio and magical space for special events and celebrations for children and adults alike. Tap into the power of play, exploration, discovery and awe. Cultivate mindfulness to rejuvenate, re-energize, re-connect. The Om Dome is a portable 700 sq. ft. geodesic dome – our mobile studio. 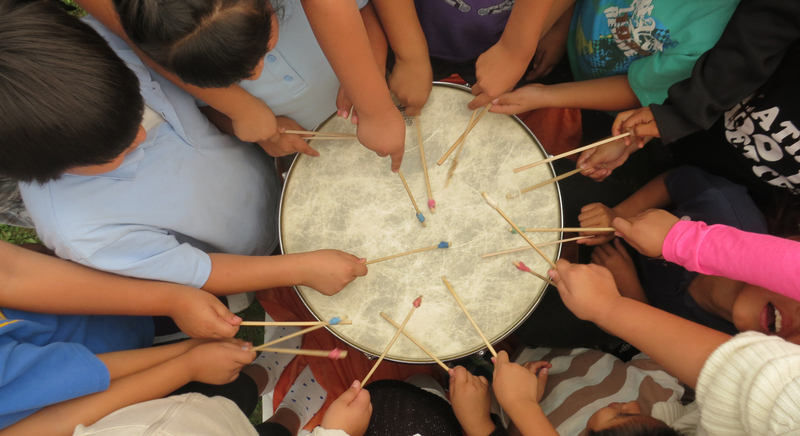 We offer: percussion, yoga, dance playshops & retreats, cultural-artistic experiences & performances, educational activities, coaching, team & community building events. Tatiana Nemchin and Joël Delaquis founded Mouvement in 2011. Drawing upon a rich tapestry of experience, training and fuelled by passion, together they use the power of movement and rhythm to help build and strengthen community and team spirit. An established life coach, certified yoga teacher and event producer, Tatiana creates and holds space for self-exploration and physical, spiritual, mental and emotional development, weaving together mindfulness practices, such as yoga, percussion and movement as tools for connecting, playing and enhancing well-being. Tatiana is a natural connector and a tested leader who builds strong authentic relationships, motivating and encouraging others to build awareness and experience fulfillment. Her positive and outgoing personality is a source of strength and inspiration. Tatiana produces and co-facilitates workshops and retreats around the globe. An experienced musician, educator and artist, Joël shares his deep passion for awareness and education using sound, rhythm, story-telling and movement as powerful pathways for discovery and transformational experiences. He embodies great enthusiasm for life and soul adventure, integrating his appreciation for nature as well as historical and cultural heritage interpretation into his programs. His visionary spirit brings depth, curiosity and expansiveness to projects and collaborations. Joël’s playful explorations, grounding nature, humour and creativity are reflected in his approach to coaching, teaching and mentoring. For information about services, programs or to book, contact us. Join us on Facebook to keep track of what’s on and where we are.